The Jan and Cora Gordon pages. 5 1916 Back in London, and short of cash. Welcome to the Jan and Cora Gordon pages . 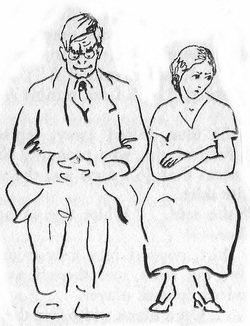 This website, is dedicated solely to perpetuating and recording the life and works both artistic and literary of a truly remarkable couple who, between the years 1919 and 1940, were something of a publishing phenomenon, writing a long series of unconventional travel books which described their travels around Europe and the USA in a style uniquely their own. Eschewing the conventional impressions of the traditional traveler they recorded in some detail the everyday lives of the folk they met, always with kindness and understated humour. 5/12/2018 Because I have a backlog of huge amount of revisions and additions due to these pages I beg the indulgence of any readers for the inevitable untidiness and odd repetition of text which will all be sorted out in time, hopefully. I am embarrassedly aware of its shortcomings, but consider it more important to get all my back up information about the Gordons on line. 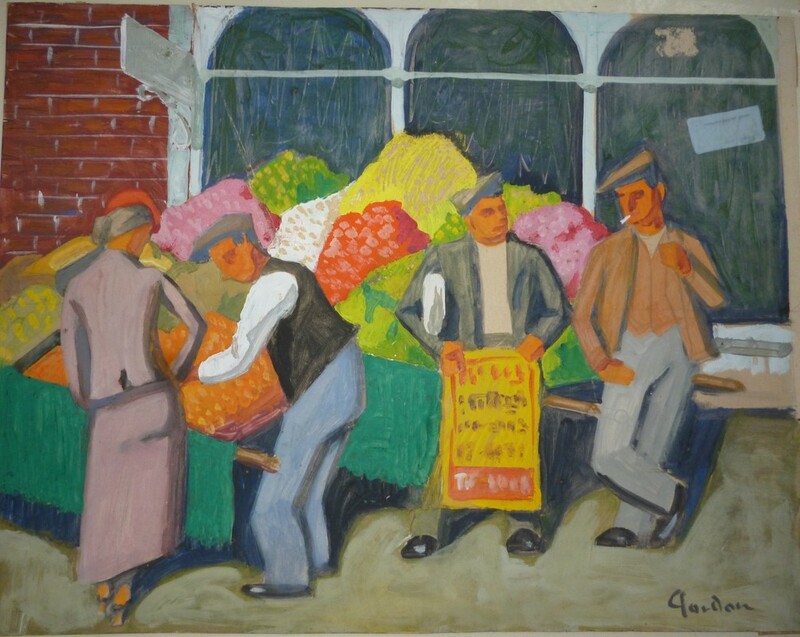 ﻿A fruitful few months since I last edited this site with some great finds, some additions to my own collection and a couple of mysteries first,yet another of Cora's Portuguese paintings this one,bought at auction was donated to the now defunct branch of the Mayfair Soroptimists of which Cora was a founder member, I have been aware of this one but not its whereabouts for some years;Now its home. Another interesting find with a mystery, it turned up in an auction in the USA I was unable to bid on it as it was withdrawn and I lost trace. Where is it now? 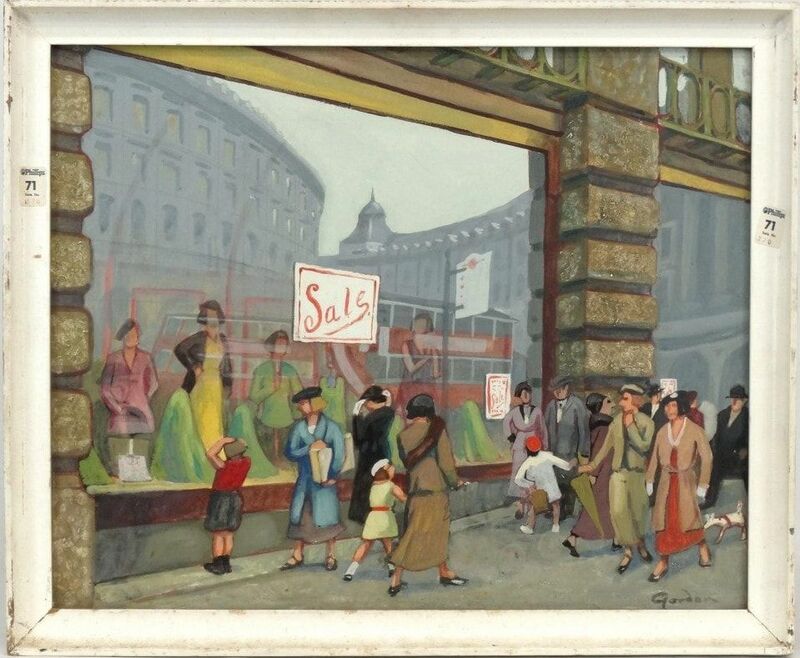 Titled Regent street exhibited Le Fevre gallery 1937 and bought by Oldham Art Gallery, or so it seems, They no longer have their one. 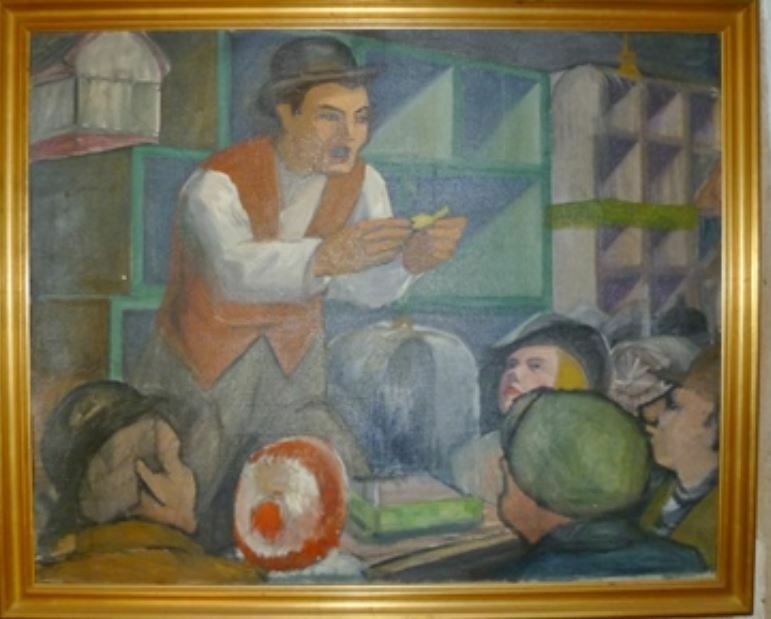 This is an intriguing find for me, The Bird Seller,depicting a street seller of canaries in Brick Lane east London mid 1930s, I have a record of it being exhibited as a smaller gouache but this is very much larger, almost 3ft wide and in oil, it is obviously unfinished compared to the gouache version. 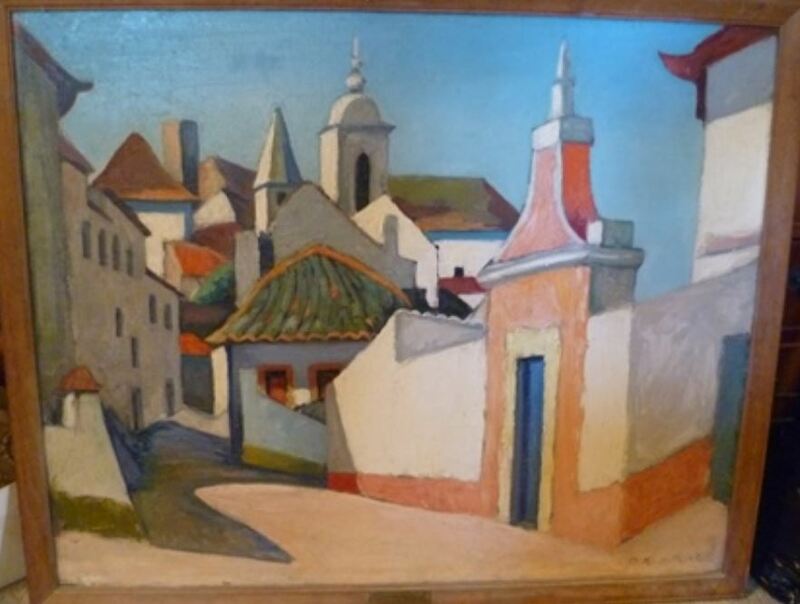 What is more interesting is that it is over painted on a canvas of Cora's work, which was the 'Nuns gate Obidos' This is the second reused canvas I have discovered and as this one is unfinished I wonder if it was one of Jans final works, certainly the re-use of canvas of unsold work indicates wartime necessity. 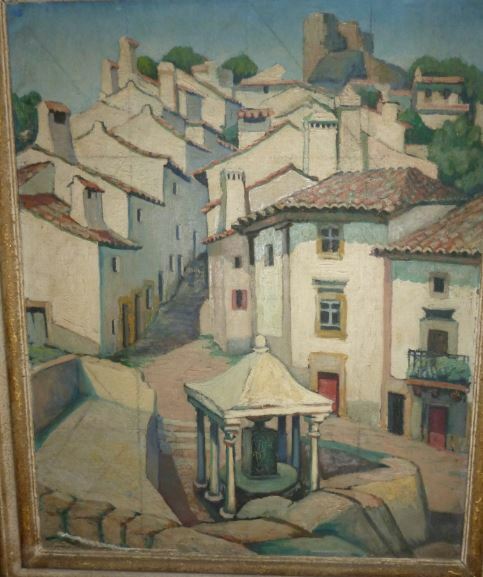 above is a Cora Gordon painting of Spain again, circa 1921/2. I was unable to buy this one when it was auctioned earlier in 2018 and it was absolutely filthy, but its new owner cleaned it and it is shown here by his permission. 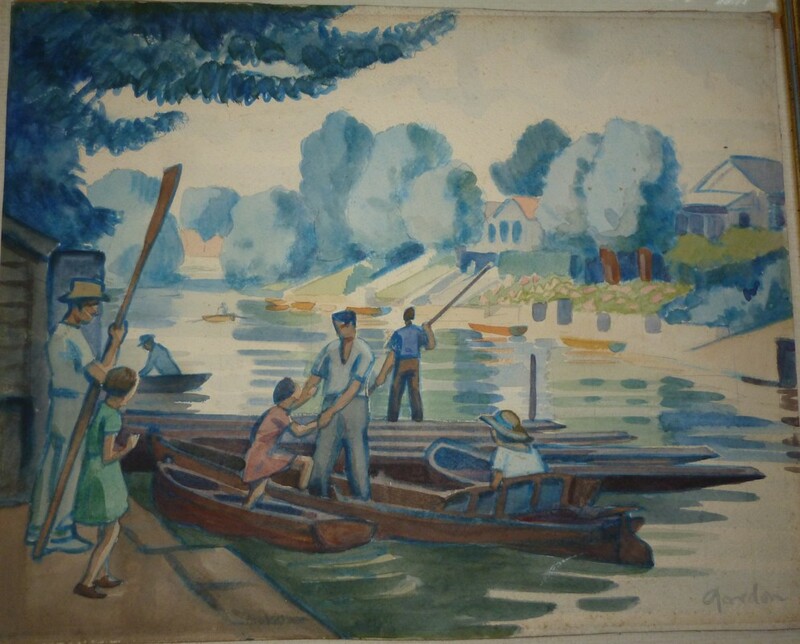 A sad story here: on the left this nice painting of Castello de Vide by Cora was, with one other presented by her the late 1930s with one other, to an educational institute she was associated with in the late 1930s . Ignored and in store somewhere they have disintegrated appallingly,almost to the point of no return. Buying them is sadly not an option,so they just get worse. Last picture find of 2015 is this super gouache by Jan, found in the Portobello road of all places just yards from their old home; It's now gone to New Zealand. 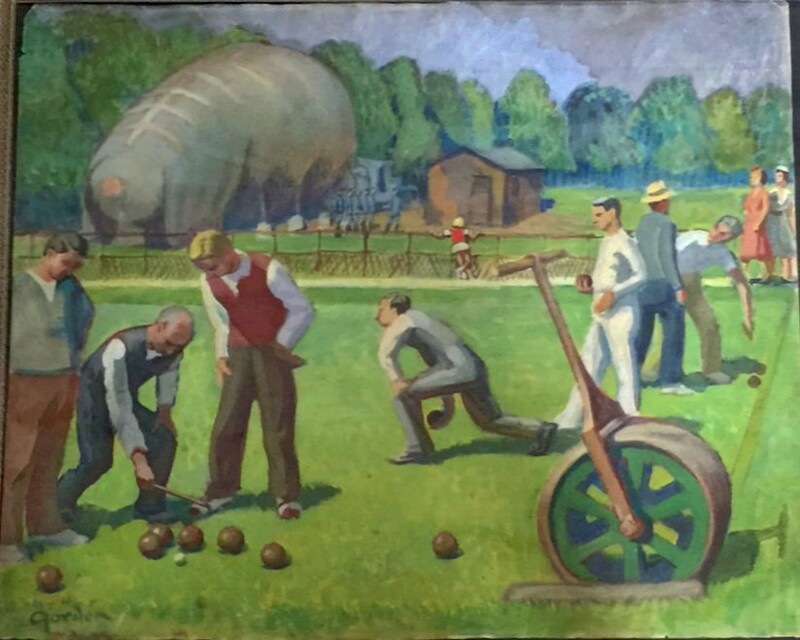 A quick bit of detective work establishes it as being the bowling green in Hyde Park.Where the barrage balloon is is now the tennis courts. Best find of 2016 so far is this portrait by Cora. Now identified as Cicely Emily Parr nee Shaw, wife of Sir Robert Parr KBE CMG who served with the British Military Mission to Serbia 1914-18. So Serbia would appear to be the connection with the Gordons. 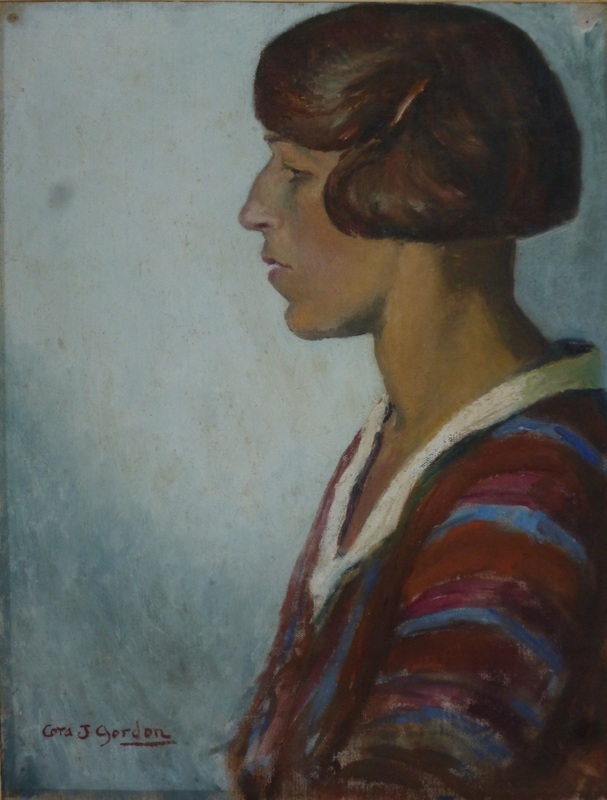 oil on canvas on board, a rare oil portrait by Cora which I am very pleased to have aquired. 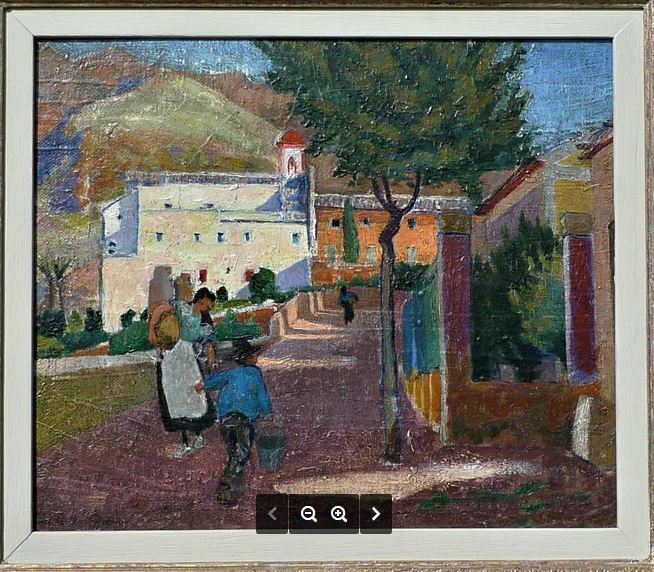 Here is a cracker of a Painting by Cora, 'Spanish Entrada', it is a variation of the Frontispiece to their first Spanish book "Poor Folk in Spain". Confirmed as being typically Murcian in aspect. It would date from 1920. Hovering over MORE on the blue navigation bar above will open up a series of pages about the Gordon lives which is constantly being revised or added to, . Most pictures on this site will enlarge if clicked on, I hope readers will gain as much enjoyment of the Gordons work as I have, their books are still to be found , and Two Vagabonds in Languedoc, arguably their finest book, was reprinted in 2007 by Benefactum Press with a preface and preamble by myself... K J Bryant,Wiltshire,UK. 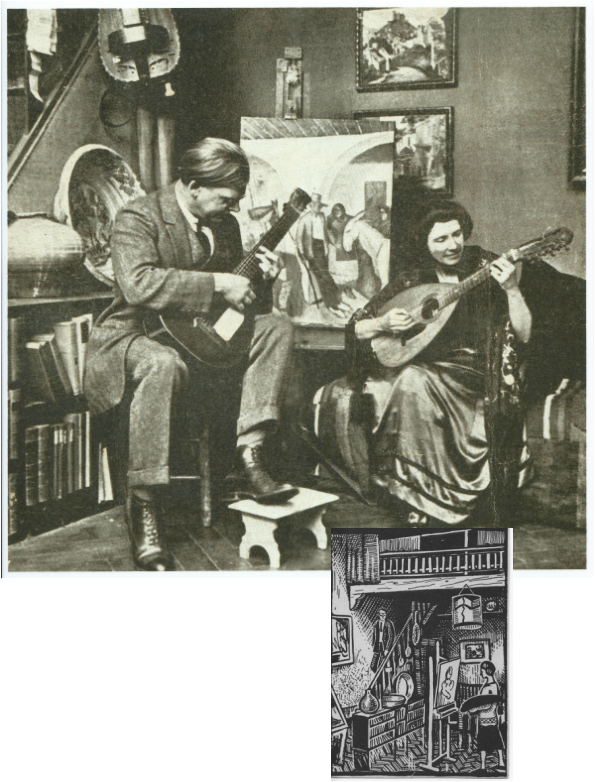 Next are a couple of photos of Jan and Cora in their Paris studio tucked away in a alley off the Rue Cherche Midi, Paris 75006. Once the stables of the Parisian omnibus horses but converted into artists studios by the mistress of a politician as her nest egg. In their time these studios hosted some famous names, at least before they achieved success. 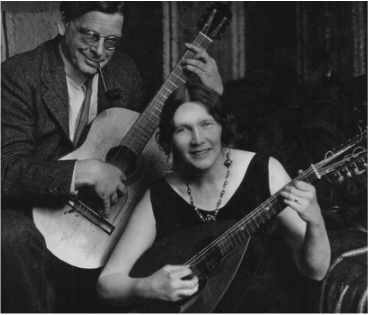 Jan and Cora moved into them around 1912/3 as far as I can ascertain, and lived there very contentedly in quite primitive conditions until 1931. The primitive toilets, a la turque, are still there, albeit used as storage sheds, and must have required some nerve for the Gordons visitors to use; and only oil lamps and a communal water tap for the 6 studios in their alley. In 1944 their studio received a direct hit from a shell or small bomb and was destroyed. As part of a set of historic buildings it was rebuilt on the same plan but set further back to comply with building regulations. Other than that they are exactly as Jan and Cora knew them and the present owner was kind enough to invite me in for tea, taken on this exact spot but sadly half a century too late to share with Jan and Cora. If you wish to visit them you'll have to do as I did, a a little detective work! The studios are well described in 'On a Paris Roundabout' and again in part in 'The London Roundabout'. 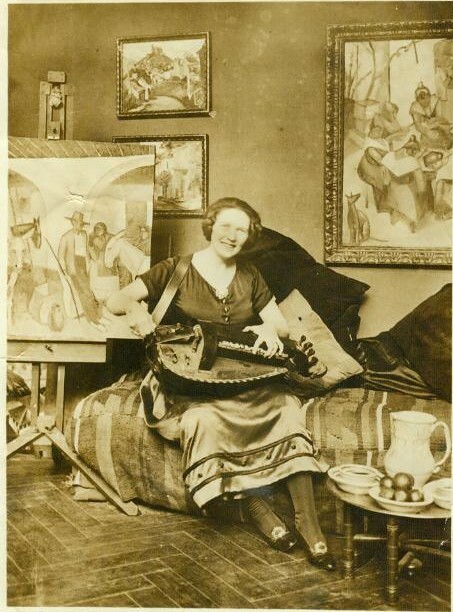 These photos date from 1923/4 and the right hand one was used for their 1927/28 USA lecture tour brochure. For me they are a mine of information; above, Cora is holding a Vielle d'Auvergne mentioned in both Paris Roundabout and London Roundabout ...the two large paintings are by Jan and are of Spain (location unknown) the two small ones on the wall are of Najac; the top one is a smaller version of one shown in Cora's art page, the smaller one is of the place of Najac...She is sitting on striped horse rugs, probably ones they managed to save from Serbia 1915, or from their 1922 Balkan trip..even the parquet floor gets a mention in one of Jan's short stories. 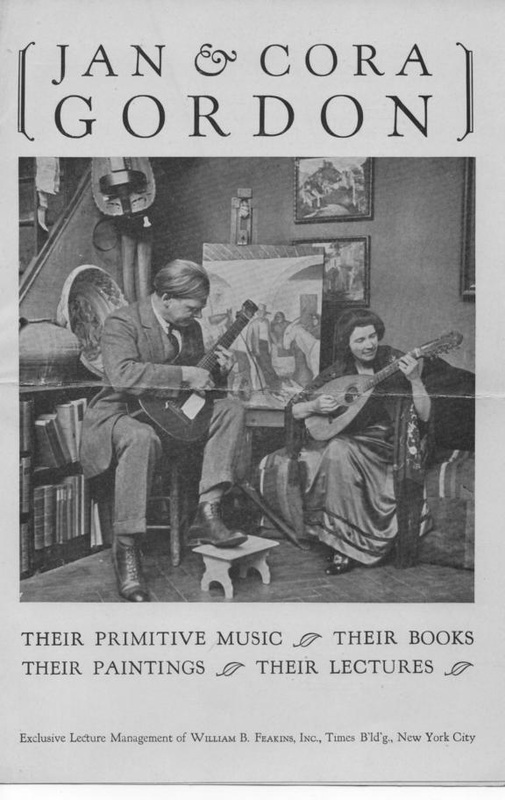 On the right we are seeing more of their 'museum of the worthless' ....the vielle is on its place on the stairs and Jan and Cora are playing their Spanish instruments, Cora is wearing one of her shawls from Spain, behind Jan is the ancient Walnut oil jar,given to them by Monsieur Tressol in Najac and the large inch thick pottery dish , decorated as Cora described, "... with blue and green rhythms, ...a cat recumbent..." that was given to them by La Merchora in Murcia 1920. I wonder where that dish is now? I know it was recorded in their London flat after 1932. The lute, the guitar and the Vielle are now in the iceberg of a storeroom of the Horniman Museum, South London, where, I am sad to say they have been badly neglected, at least when I last saw them in the mid 1980s.